This is the soup I crave on nights I want soup with a sandwich (great with grilled cheese or garlic knots!). It’s super easy and can be made anytime of the year because it uses canned tomatoes. This soup is adapted from my Slow Cooker Tomato Soup recipe which I changed up a little to make it work in the Instant Pot. I also changed the method and ingredients slightly so if you notice the nutritional info is different, that is why. I highly recommend using Pecorino Romano, I’ve tried this with other brands and the flavor just doesn’t compare. This soup freezes well which is great for meal prep if you want to make a few dishes ahead for the month. This is the soup I crave on nights I want soup with a sandwich (great with grilled cheese or garlic bread!). It’s super easy and can be made anytime of the year because it uses canned tomatoes. Use the saute button on the Instant Pot, then add the oil and butter, when melted add the celery, carrots and onions; cook 5 to 6 minutes, or until tender. Add the flour, stir and cook 1 to 2 minutes. Add the broth, milk, and pour the juice of the tomatoes into the Instant Pot, then roughly crush the tomatoes with your hands; add to the pot. Add the thyme, basil, and bay leaves and parmesan rind if using. Cover and cook high pressure 30 minutes. Quick or natural release, remove the cheese rind and herbs then blend the soup using an immersion blender until smooth (or you can carefully do this in small batches in the blender). Add the 1/3 cup grated Pecorino cheese, salt and pepper, adjusting to taste. To serve, ladle into bowls, top each with basil and 1 teaspoon parmesan. Made this recipe this morning, I cannot tell you how much I loved this soup. We’re staying with my father-in-law while we sell our home, and I didn’t realize until I was ready to blend my soup that he doesn’t have the power cord for his blender anymore. Guess what? Chunky tomato soup is delicious! 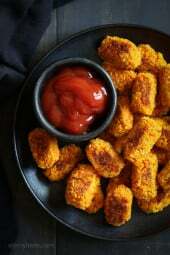 This recipe was so so so delicious and easy to make! I subbed the milk for lactose free skim milk and it was still delicious. Plus it made my house smell amazing all day! What can I use instead of an immersion blender? This is splendid – it is simple to create plus one of those soups that seems better the second and third day. I do not have (nor want – limited kitchen storage) an Instant Pot, so I simmered this on the stovetop covered for one hour then uncovered for another hour. Since I knew the immersion blender was part of the end product, I was not precise with vegetable chopping nor measurement (I tend to round up on vegetables) and decided to use the entire chicken broth carton contents. Early on, I learned from Gina parmesan rinds are value-added elements to many simmered product; when I am near a Wegmans I generally purchase a few for my freezer stash. Would this recipe fit in a 3qt instant pot or would I need to adjust measurements? Made this in the instant pot today instead of slow cooker. Amazing! This is my favorite tomato soup of all time. I doubled the recipe. Another great recipe, Gina. Both the flavor and the consistency turned out great. This is my third time making this soup. I went cheap on the tomatoes bc Tutturoso Whole Peeled Plum were on sale and the San Marzano tomatoes I usually use were much more expensive. Should have gone with the San Marzano. The taste was so much better with them. This one is a bit blah. Oh well, live and learn, I do love this recipe though. I have a 6 qt Instant Pot…would it be large enough to double the recipe in? I want to make this recipe as it sounds SO GOOD! Is this soup in your cookbooks? I just purchase 3 of them. Want to save but if it’s in the books There no need! Thank you for all the wonderful recipes!! I JUST made this. OMG….soooooo good!!!!! Would skim milk work for this recipe? Thanks!! Can this soup be canned? At the end when you say take out herbs, does that include the cut up basil? I think that probably gets blended up right? Made this tonight but doubled the recipe. We tried it tonight while still warm, although we weren’t actually eating a meal tonight – late lunch today. Hoping it’ll have more “tomato” flavor tomorrow after it sits in fridge overnight, as most tomato dishes do. May add more tomatoes if not. It’s got good flavor with all the veggies, especially adding basil & parmesan cheese but husband agreed, a bit bland. Didn’t use the rind in the recipe either & not fresh herbs, just from my pantry. I’m surprised this recipe works in IP. Usually pressure cooking milk results in curdling. It’s also not recommended to add thickener before pressure cooking. Guess I’ll give it a try and see how it turns out! Actually it was fine after blending! I made this tonight in my new IP. I didn’t know it isn’t recommended to add thickener before pressure cooking and I didn’t have any problem with it. I love tomato basil soup but after removing the thyme and bay leaves and used my immersion blender, I thought it tasted bland and added more salt and pepper—still bland. I added a 6 oz. can of Hunt’s (no salt) tomato paste to it and that did the trick. I really like the flavor now. It’s difficult to try and please all taste buds but I like reading the reviews so I can always learn or try something new—no disrespect to Gina. I just made this on this rainy Saturday but it came out very thin and watery. I used gluten free flour – could that be why? Should I add more flour or maybe corn starch to thicken it up? Let it simmer on sauté? (This is my second time using my new instant pot! )I also used San Marzano peeled tomatoes since that’s all that Trader Joe’s had. They were still whole… but maybe the skin makes a difference? The taste is great but definitely needs to be thicker. Thanks in advance for any advice! The time saved on this is INSANE for the same flavor!!! I love this soup but always takes forever to make it. This was so nice and everything in the instant pot was so easy! Took a total of less than an hour start to finish when the other version took 8-9 hours!!! Thank you so much!!! Very creamy and delicious! I love that it’s a great way to sneak my veggies in too! What herbs should I remove? The bay leaves and thyme I know. But do I remove the basil? Mine turned out really watery. I guess maybe next time I’ll add more tomatoes to make it a little chunkier. So so good!!! I was skeptical but was the best tomato soup I’ve had! 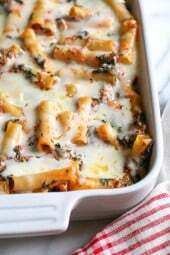 I didn’t use the cheese rind, also used 2 tblsp of ground basil leaves and 1/2 tsp of ground thyme. I have made this several times. I used to do the slow cooker one but adapted it to my pressure cooker. This one is even easier, incorporating the flour earlier in the recipe. Usually I leave out the cheese and let my family put in their cheese at the end, but I do use the cheese rinds when available. It’s a family favorite. Thanks, Gina! made this last night & it was amazing. The only thing is that i felt like i had to add alot of salt & pepper for more flavor. All & ll this was a great EASY dinner with some crusty bread on the side for a winter night. Thanks Gina again for somthing super yummy, my whole family will eat! Hi Gina, I made this soup yesterday and I wasn’t terribly impressed. I followed the recipe exactly and I didn’t find it as tomatoey as I expected. the texture and colour was great. Just not big on flavour. I love Skinnytaste recipes and make them frequently but I was not a big fan of this recipe. It just didn’t have the depth of flavor that I had hoped for; It was just ok…we will finish up the soup but I won’t be making again. I love Skinnytaste recipes and make them often, at least 3 times a week. Unfortunately, I found this recipe to be a disappointment. I followed the recipe exactly, used the cheese rind, but found the soup to be lacking in depth of flavor. It was just OK but I will not be making again. quick release means that you move the valve over from sealed to vent to release the pressure (a burst of steam) Natural release means that you don’t have to do anything. After it cooks for the # of minutes you put in, it goes to keep warm and begins to release pressure–takes about 10-15 mins and the little pressure thingie falls, so it’s safe to open. Love all you PC recipes. I just bought your new cook book, does your first one have more PC recipes I noticed this one only has a few. Amazing delicious soup. Made for the first time tonight, won’t be the last! I made this using over ripe garden tomatoes, blanching first to remove the skins. This might be my new favorite tomato soup recipe. I used organic 1% milk because that’s what I had, but other than that I followed the recipe to a T. This was my first recipe I used the “sauté” function in my instant pot and it was easy to use. My only question is, what function should I use; venting or sealing? Awesome. To cook you want seal. I have a garden full of tomatoes. Can I substitute them for canned and if so what prep needs to be done to them first? Sure you would have to peel them first. I’m new to your site and was wondering how you make your garlic bread that goes along with this recipe? Any tips to lighten it up? Thanks! I use whole wheat bread and spritz with olive oil. My son has a dairy allergy Do you have any recommendations on dairy substitute for the milk? I can add the cheese individually. I was thinking maybe coconut milk (the kind you buy in the can, which seems thicker than some that come in cartons. What are your thoughts? Thanks for any help! Since my kids don’t typically eat soup, I used 2 cups of this yummy soup (made perfectly as instructed in recipe) with spaghetti. I added 1 tsp of Italian blend seasons, 1/2 tsp of garlic powder, drizzle of garlic infused EVOO, and 1/4 lb cooked lean sirloin (I had frozen from a previous meal). What a way to sneak in those veggies! WE all loved it. I think I found a healthy, yet delicious alternative for homemade tomato sauce! Definitely cook the spaghetti or any pasta ‘al dente’ since it is a soup to avoid mushy pasta. I had to think ahead to avoid my 4 year old son’s ‘hangry’ wrath! How would I have to modify if I use whole tomatoes in purée? Love tomato soup! Especially when it doesn’t have loads of cream. I increased the tomatoes so I could use up my entire 100 oz can knowing I could adjust everything else to taste. Kept everything else the same and I love it both ways! I made this last night for our soup club lunch swap at work and it was a huge hit! The Parmesan rind is a must!! It gives off such great nutty flavor, without the added fat! I didn’t have 2% mild, so I added just 3/4 cup of half & half and it worked out great. I will definitely be making this again! Yes, I love the Parmesan rind too! I made this yesterday for supper. I expected it to have more tomato taste. Also I couldn’t find the same brand of plum tomatoes so I used Unico. I did replace the milk for almond milk. I didn’t have time to get this going in the morning so I just cooked it on the stove. Did first couple steps as usual but when I was done adding the broth and tomatoes I boiled in high for 20 minutes or so. Then I put a strainer over a big bowl and poured the soup over it. I put what was in the strainer in a food processor and blended until smooth. Then put it all back in the pot and heated it up again. I used vegetable broth instead of chicken. It was so good! This is genius! Thank you for this comment because I was wondering how to make this with a small blender. does your Slow and fast book have the SP in it also like your website? Hello Gina ! Would I be able to use a crock pot ? Gina, do you suggest any high protein sides?? A salad on the side would work, my Italian chopped salad in my newest book has chickpeas and hard boiled eggs. 1-1/2 cups. Serving size is always listed right before the nutritional info. I am so extremely excited that thee are more and more Instantpot recipes on your website! I got one for Christmas and I want to use it ALL THE TIME! I am making this soup right this instant and it smells heavenly! Awesome, trying to post 1 new one a week when possible. My favorite soup recipe of yours; please continue to post the slow cooker version for those of us who are not using instant pots/pressure cookers. Thanks for sharing all of the yummy recipes; I’ve enjoyed so many of them. Made this over the weekend and it is delicious! Not overly tomato tasting. 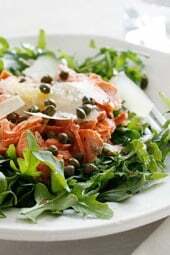 The extra basil and grated cheese add some great flavor to it as well. Perfect with a grilled cheese sandwich! At 20g of carbs in a serving, this is NOT low carb (I found this link when searching for low carb recipes). It does sound yummy though so I will make it and try to reduce the carb count. Thanks. 20g of carbs isnt that much.. It is when it is just part of a meal – most people would eat the soup with a sandwich or crackers. It has little protein so is not an entree. Made this last night and my parmesan rind dissolved into the soup. It was delicious though… but not sure how to count the points… just add one smarpoint for good measure? Also, we didn’t have celery on hand and omitted them from the recipe. Our soup turned out a bit thin as a result. We added a cup of tomato sauce to compensate. Will definitely make again! Wow that’s interesting that it disappeared! I bet it tasted great! My rind also disappeared! The whole soup seems thin but I’m looking forward to tasting it. Which immersion blender do you use? I made this soup tonight for my first instant pot meal and wow it was delicious and easy to prepare! I will definitely be on the lookout for more instant pot meals from you, Gina :). Thanks for another great recipe! I eat vegan during the day. If I wanted to make this for lunch, what could I substitute for the Parmesan rind and milk? I’m sure it will work, I would add more salt. Good idea. I could probably substitute almond milk and maybe use a little miso to increase the umami factor. Thanks! Would canned unsweetened coconut milk work?? I think it would, but it would probably be a bit sweeter than I’d want. May be a silly question, but would using the same size can of diced tomatoes change the taste or texture of this soup in any way? Personally I think the flavor of the whole canned tomatoes is better. I’ve heard they save the best tomatoes for the whole canned tomatoes, and in a tomato soup you’ll want the best tomatoes. But I think diced tomatoes would work. Just not as well. Diced tomatoes start as the same whole tomatoes. Yes, they like to use the pretty ones for the wholes, but the same good quality tomatoes are used to make Diced, Crushed or Puree. Diced will work fine in this recipe. I used the Dole fire roasted diced tomato.. yummy flavor! Looks amazing! Can I leave out the milk and add more broth? I don’t do instant pot, but I love that you adapt so many of your recipes to cook however we choose to cook. I have never used the slow cooker so much in my life as I have since buying your “Fast and Slow” book. I just happened to make this soup yesterday (crockpot). I make it about once a month and double the batch so I can freeze some. My husband says this is the best soup I make. Thank you, Gina, for ending the What’s for dinner?” conundrum; I know I can always reach to one of your books and find something delicious from the staples I have on hand. You’re a genius! Can you recommend an instant pot? There a a few options on Amazon but I am not sure what to buy. What kind of instant pot do you recommend? I’ve never heard of an ‘instant pot’. Is it the same as a pressure cooker? I love tomato basil soup and this sounds delicious! Thanks for pointing this out. I can’t have even half that amount. The salt is from the cheese and maybe the tomatoes. I don’t know how much is in that. Surprisingly, celery is high in sodium. It is sometimes used in fermenting to add sodium. Tasty. Perfect with a cheese toastie oooops! How does this do when cooked on the stove top in a regular pan? How long would it need to cook? Yes, I would let it simmer low covered about 35 to 40 min. I’ve made the crockpot version a number of times. 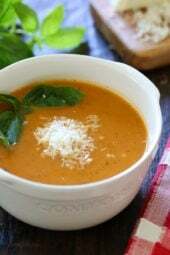 Super easy and my favorite tomato soup. One question: Since the Parmesan rind is listed as optional, does it change the point count if you use it? My guess is no because it doesn’t break off into the soup, it gets tossed. I can’t eat flour, would it be a problem if I left it out. Would something else work in its place? Just so happens I made this (the crockpot version from “Fast and Slow”) yesterday. It’s really delicious. The flour is just used to thicken it, and it’s fairly thick. You could enjoy it a bit thinner without the flour, or use an alternative thickener such as xanthan, corn starch or arrowroot. Corn flour would be good too, but it would give it a slightly corny taste. We crushed corn tortilla chips on top of ours and the combo was really good. It’s a really tasty soup, so one way or another, you should try it. I’ve made it without the flour and it’s delicious. Great recipe!!!! My husband loves tomato soup i most definitely will make this???? I’m sorry to ask a stupid question. How tomato-y does this taste? I can’t stand tomato juice or canned tomato soup. But I’m thinking with the veg, milk, and basil, the tomato taste would not be overpowering? I’m going to do it with fresh tomatoes. I think she says canned just for the convenience , that’s all ???? It’s tomato soup. It tastes like tomatoes. Why be snarky? If you didn’t like the question you could have just ignored it. Obviously she was asking if the tomato taste would be muted at all due to the long list of other ingredients. Gigi, You’re hilarious. I also love comments about “I don’t have any of the right ingredients so if I substitute everything. how will that affect it?”. Actually despite the sarcastic comment, I made this tonight and in fact my first through was that it didn’t taste quite tomato-y for my taste so I’m going to tweak a bit next time but might be just right for you! I agree. I do not like alot of tomato sauces either on pizza or in Italian restaurants. I believe she gave a specific type of canned tomato and hope that will reduce the acid taste you sometimes get with canned tomatoes. You can add carrots. Their sugar changes the tomato flavor to more pleasing, But that will increase carbs. Just try it in a small batch. If to tomatoy. Try adding something sweet to reduce the acid. Remember to watch the carbs. I did not think you question was stupid, by the way. I HATE tomatoes. As in I don’t like ketchup, spaghetti sauce, salsa, etc. BUT I love this soup! I make it every few weeks. It is so easy too! I love your recipes and this sounds amazing. I don’t have an Instant Pot. Can this be made on the stovetop? Yes it can, double the simmer time.